Charles Buek & Co. often maximized its profits by eliminating one step of the speculative real estate process—acting as both the developer and architect. Such was the case in 1885 when the firm began the project of five brownstone-fronted rowhouses on East 69th Street, between Madison Avenue and what would become Park Avenue three years later. The houses, Nos. 21 through 29, were completed in 1886. Four stories tall with expected high brownstone stoops, they attracted well-to-do professionals, like Samuel Riker who purchased No. 27. The 55-year old lawyer and his wife, the former Mary Anna Stryker, had five children: John, Anna, Henry, Samuel and Julia. The family maintained a summer estate, Fairview, at Corona, Long Island. 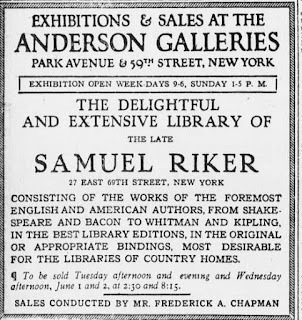 As was expected of well-heeled homeowners, Riker filled the 69th Street house with a valuable art collection, including paintings by Albert Bierstadt, Daubigny, and William Hart. 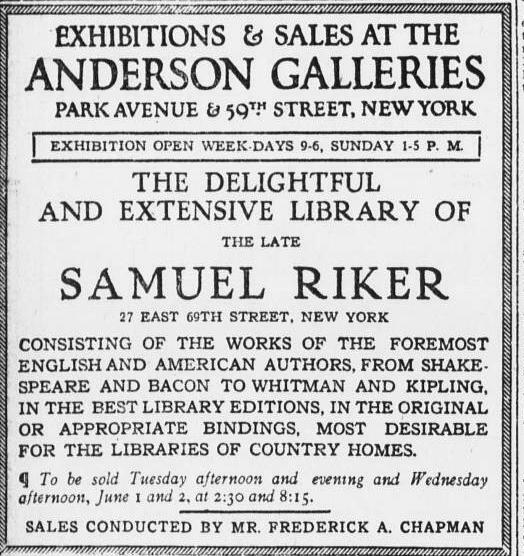 Riker’s impressive library included rare examples of first editions and documents. Perhaps his most prized possession was the collection of political papers amassed by George Washington. It included “all the treaties of peace, alliance and commerce between Great Britain and other powers from that signed at Munster in 1648 to the treaties signed in Paris in 1783,” according to the New-York Tribune years later. The wedding of daughter Julia in St. Bartholomew’s Church on the afternoon of April 6, 1892 most likely prompted a few raised social eyebrows. The groom was her first cousin, Richard Riker, son of Samuel’s brother, John H. Riker. It resulted in a complex tangle of Riker surnames to be sorted out in the reporting of the ceremony; however society columnists diplomatically avoided mentioning the close family ties of the bride and groom. Instead they focused on the gowns of the bridal party and the “handsome scarfpins of diamond bowknots” worn by each usher, a gift of the groom. Following the ceremony the reception was held in the 69th Street house. Other Riker marriages would soon follow. Samuel Jr. was married to Frances M. Townsend on November 18, 1896; and brother John Lawrence Riker married Carrie Duncan Leverich on December 12, 1900. John’s wedding was on Long Island and the reception held at the family’s country estate. This marriage ended tragically. On July 22, 1907 Julia and Frank were staying at the Hotel Thorndike in Boston. They invited two friends, Thomas B. Lucie and Edward D. Ditmars along on a day trip to Nantasket Beach. The party left in the Harmon automobile (described by a Boston journalist as a “ponderous thirty horse power machine”) which was driven by chauffeur John McCarthy. McCarthy sounded his horn and the wagon driver, Beverly Pearson, tried to stop; but the automobile struck the horse, killing him instantly, and throwing Pearson out of the wagon. The collision caused the tires to burst and the limo skidded another 20 feet where it caught on the streetcar tracks, and overturned. Frank Harmon and Ditmars were pinned underneath and the other three passengers were thrown out. “Wounded and bleeding” the three rushed back to the wreckage. “Mrs. Harmon ran to the automobile and vainly strove to get it from her husband,” said the article. A farmer, Fred W. Spring ran to help and two other cars headed for Boston soon stopped. Working together they were able to upright the vehicle. Although two Hingham doctors soon arrived, Harmon died on the roadside. His skull was fractured in two places. Julia spent the night in the Boston hotel and accompanied her husband’s body back to New York the following day. John Lawrence Riker became ill in March 1909. With little warning, he died soon afterward in the Presbyterian Hospital on Thursday, March 25. His funeral was held in the Riker house on East 69th Street. The door of the house would be hung in crepe again two years later. Samuel Riker died in the house at the age of 80 on Sunday night, November 19, 1911. His funeral was held in the parlor three days later. At the time of Riker’s death, No. 27 East 69th Street was valued at $75,000; in the neighborhood of $2 million today. His net estate of three-quarters of a million dollars would translate to about $18 million in 2015. The year that Samuel Riker died Albert and Lucretia Strauss commissioned the architectural firm of York & Sawyer to update their aging house at No. 325 West 75th Street. The $18,000 in alterations included “partitions, skylights, change stoop.” The Strausses, the architects, and the Riker house would all come together within a few years. Mary Riker died in the house on Thursday, July 17, 1919. Within the next few months the Riker heirs began emptying the family home. In June a two-day auction sold off their father’s prized library. A. S. W. Rosenbach purchased the George Washington documents for a staggering $4,000, bringing the total sales to $14,595. The house which had been home to the Riker family for three and a half decades was sold to Albert and Lucretia Lord Strauss. As was customary, Strauss put the title in his wife’s name. The pair set to work bringing their architecturally outdated home into the 1920s. York & Sawyer was commissioned to transform the old brownstone into a modern mansion. On February 4, 1922 The American Contractor reported that the planned alterations would cost about $50,000. The completed renovations resulted in a neo-Tudor fantasy clad in ashlar fieldstone. Grouped, multi-paned windows dominated the second and third stories. The main entrance and the service door were joined by a continuous square-headed drip molding. Somewhat a financial prodigy, Strauss had entered the College of the City of New York at the age of 15. After graduating, he joined the international banking firm of J. & W. Seligman & Co. He was 32 when he married Lucretia Mott Lord in 1896. 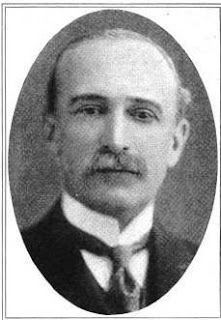 He became a partner in Seligman & Co. in 1901. During the war years he served on the Treasury Department’s War Trade Board and on the Federal Gold Export Committee. At the war’s end he advised President Woodrow Wilson on financial matters relating to the transitioning of peace and served as a Treasury representative at the Paris Peace Conference. By the time they purchased the 69th Street house, the Strauss daughters, Anna, Katharine and Marjorie, were adults; but still the unmarried Katharine and Anna moved in with their parents. Albert Strauss died unexpectedly of pneumonia in Atlantic City on Wednesday, March 27, 1929. Two days later, the East 69th Street house was the scene of his funeral, attended by only the immediate family and close friends. Except for a total of $12,500 in bequests to three employees, Albert’s entire estate went to Lucretia. She stayed on in the house with Anna and Marjorie. The Strauss women were little affected by the Depression. Their daily routines included, of course, dressing for dinner. It was a routine that was unexpectedly upset on the evening of November 20, 1931 when Anna was nearly ready to go down to the dining room. Lucretia Lord Strauss died in the house on February 6, 1935 at the age of 68. Her estate of just under $3 million included the house which was valued at $95,000. Katharine had married business executive Henry J. Mali in 1929 and the couple was living at No. 55 East 72nd Street. Within the year the Malis would move into No. 27 East 69th Street and Anna would go to No. 136 East 65th Street. Their aging uncle Frederick Strauss, who had been a partner in of J. & W. Seligman & Co. with Albert, moved in with the Malis. Frederick died at the age of 72 of heart disease on August 11, 1937. Katharine and Henry Mali would continue to live in the house for years, the couple routinely appearing in the social columns. Katharine was deeply concerned about death with dignity and was instrumental in the introduction of the living will. In 1955 she joined the board of directors of the Euthanasia Society of America, and became president of the Euthanasia Educational Council in 1969 (the name was changed to Concern for Dying in 1978). She was on the board of Planned Parenthood as well. She died at the Mali country home in Winchester, Connecticut at the age of 78 in June 1980. Henry died in the Manhattan home on June 8, 1987. No. 27 East 69th Street remains a single family home, unchanged since the remarkable make-over of 1922. It was York & Sawyer who restyled the house. Says the house is a single family yet the flagpole would seem to indicate an institutional use or consulate? It now belongs to the Côte d'Ivoire in an official capacity.